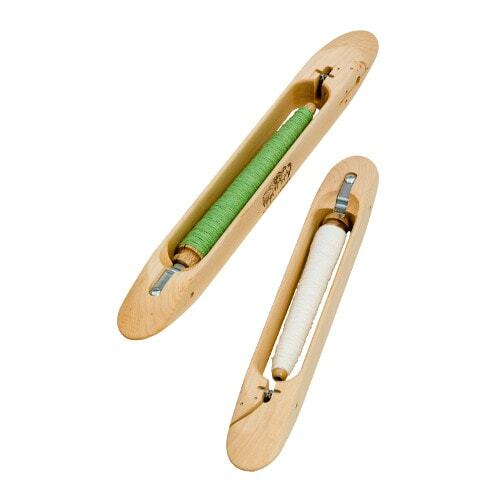 Schacht End-Delivery Shuttles are the ultimate in shuttles, designed especially and precisely for handweavers. They are lightweight, comfortable to throw and catch, adjustable to a variety of yarns, and easy—really easy—to thread. Our end-delivery shuttles are available in 12″ and 15″ sizes. How the end-delivery shuttle works: The end-delivery shuttle uses a pirn that remains stationary, instead of a free-spinning bobbin. The weft yarn unwinds off the pirn’s tip when the shuttle is in motion and stops unwinding when the shuttle stops. The yarn comes off the pirn and goes through a set of tension pads and comes out of the shuttle at a constant tension. This even delivery of weft causes less draw-in, which in turn makes better selvedges. Resist the temptation to handle the weft yarn at all. Simply adjust the tension with the enclosed Allen wrench to suit the yarn you are using and allow your shuttle to do the work. You’ll love how you can weave more rapidly than ever.